Perhaps my favorite place in the entire world is Venice, Italy. The unique and romantic city built upon water is like no other destination to visit: the history, the art, the architecture, the amazing food! So this year, I started thinking about how I would love to have some ornaments for my Christmas tree celebrating this wonderful place, and started looking for choices. I was really pleased with some of the beautiful and fun ornaments I've found, so I've assembled the best of the best here for other "Italophiles" to enjoy. 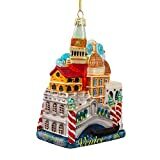 You'll find beautiful glass ornaments of Venetian landmarks, photographic ornaments and more! Any of these would be great for remembering a trip taken in the past, or perhaps as a gift for someone you know who loves Venice, Italy. If you only want or need one ornament to remember and celebrate Venice, then this one may be your best pick. 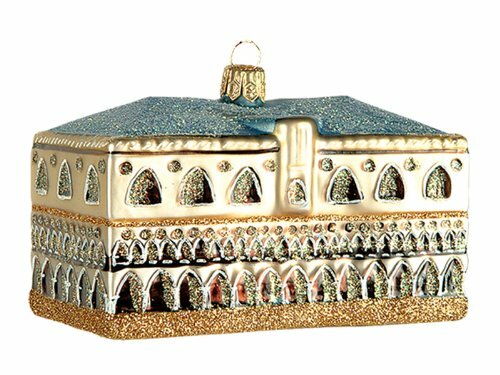 All ornaments from the Kurt Adler brand are highly collectible and great mementos for remembering a favored trip. Here we have a cityscape with some of the most unique sights of Venice: a masquerade mask, a gondola, the Lion of St. Mark, and numerous buildings and landmarks. Made of colorful glass, it will sparkle and shine for many years to come. Venice...a city of pure magic! The Doge's Palace is one of the most famous landmarks in all of Venice. It was the residence of the Doge during the Republic of Venice up until the Napoleonic Occupation in the 18th century. Today, it is one of the most popularly visited museums in all of Venice, housing important works of art by Tinteretto, Titian, Veronese and others. One can also tour through the armory and prison cells, where allegedly even Casanova was once held - and escaped! The Doge's Palace in Venice, Italy. Another landmark of St. Mark's Square and pilgrimage site to many is St. Mark's Basilica, easily one of the most beautiful churches in all of Italy. Inside the church glimmers with mosaic artwork, and one can climb up to the balcony to get incredible views of the Square and the lagoon. The beautiful Basilica of St. Mark in Venice. No one comes to Venice and misses a chance to cross the Rialto Bridge - the oldest crossing the Grand Canal and connecting the San Marco and San Polo districts of the city. Though lined with shops today, the tourism does little to diminish its beauty and impact on visitors seeing it for the first time. 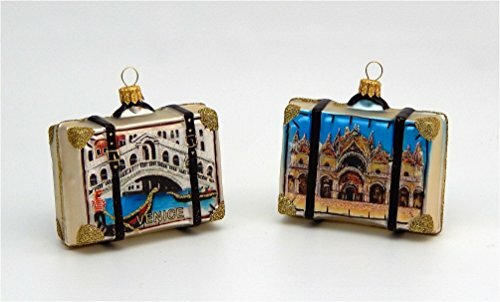 Hand-decorated and individually gift box, this is a charming recreation of the classic Venetian landmark. The Rialto Bridge in Venice. Celebrate an upcoming journey...or remember a special trip! Are you getting ready to go on a trip to Venice with your family or loved one? Then this is a perfect ornament to celebrate that upcoming journey. 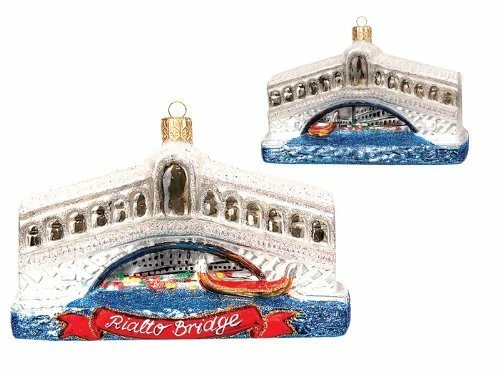 Handpainted, one side captures the Rialto Bridge while the other St. Mark's Basilica. Venice...there's nowhere else like it in the world! Venice is full of color, history and so unique! Love Disney - AND Venice? Then this is the perfect choice for you. 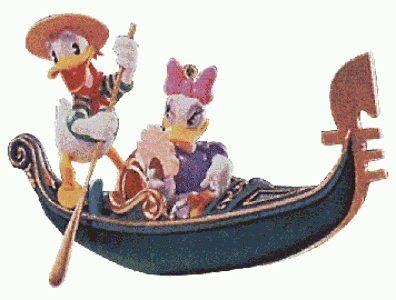 Join Donald and Daisy on a romantic gondola ride in this adorable Christmas ornament. Have you ever been to Venice, Italy? Yes, but I didn't think it was all that special. No, and I doubt I'll ever get there. 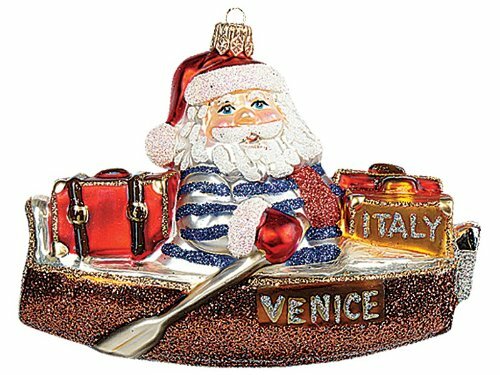 Even Santa Claus gets to Venice a little different than usual! Or maybe he's getting ready to take a well-deserved vacation in Venice after delivering all of those Christmas gifts. 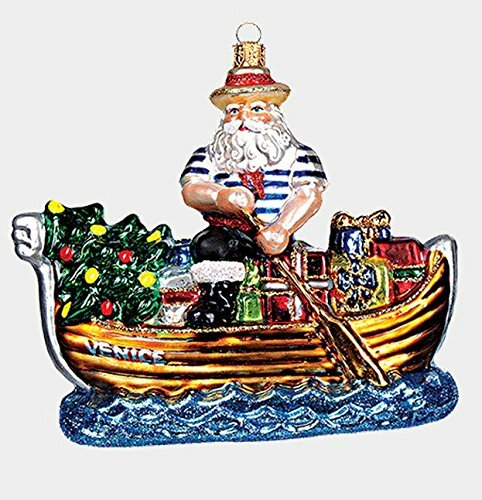 These two super-cute glass ornament features St. Nick steering a gondola and dressed in more typical gondolier attire than his usual red suit! They should absolutely bring a smile to the face of anyone who has fond memories of a Venice vacation, and the detail and color on them are amazing, too. I would like to run across such beautiful ornaments on Amazon, yet I seem to not fnd such things. 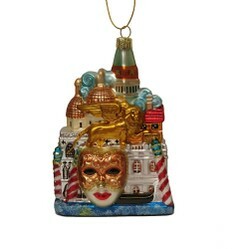 Love these ornaments - what wonderful memories they evoke of Venice! I had the wonderful experience of vacationing in Venice in 2013. It was the most amazing thing - I did not want to come home. The one thing I buy for myself when traveling is an ornament. It makes decorating the tree a walk down memory lane for so many trips over the years. Great article!